As the summer has just started, we continue the fascinating series of interviews, talking to the most outstanding members of e-Commerce community. This time, our blog guest is James Bavington, technical director at Creare. 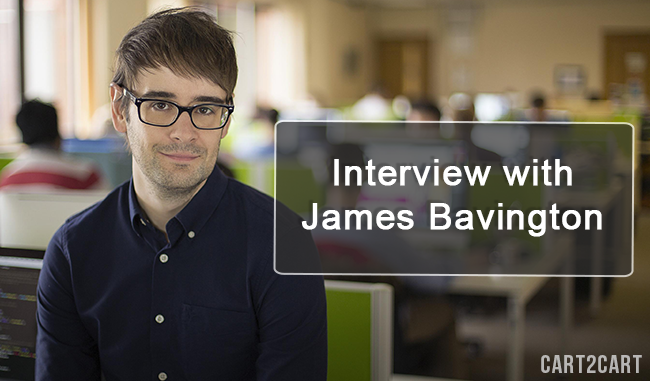 We’ve asked James a few questions about the current state of e-Commerce, SEO, advantages of different popular platforms, and he was kind enough to provide us with some interesting answers on a short notice. James, you’re a Magento, WordPress, WooCommerce developer, an SEO expert and an overall e-Commerce specialist. Which one of these activities do you like to do the most? To be honest, that's a difficult question to answer. Each stage of a project can be equally rewarding whether it’s the design, build, optimisation or ongoing digital marketing. If I had to define what I enjoy the most, I guess it would be working with the client to define the strategy and objectives and then working with my team to deliver them. Currently, you’re the Technical Director at Creare. How would you define the main goal of the company? What is the best thing about working there? Our primary goal at Creare is to make our customers' businesses great by delivering a digital presence that works as hard and affordably as possible. I believe that the best thing at Creare is the people. Over the past nine years we've built up a team of over 120 employees with a variety of experience and expertise in digital which we channeled into everything we do. Out of all the shopping platforms you’ve dealt with - which one is your favourite? And why? Although it would be a toss-up between Magento and WooCommerce, I'd say Magento just pips it as my favourite. Although not always the best solution for all small businesses, Magento CE provides a solid, secure platform that can easily be tailored to suit just about any merchant. With great community support and an extension available for almost any customisation or integration, Magento does a lot of the hard work for you out-of-the-box. As for today, the most popular shopping carts are Magento and WooCommerce. You’ve worked with both of them - so, which one is more SEO friendly? Give us your professional opinion. Both WordPress and Magento come with some fairly comprehensive SEO features as standard. However in my experience they both require adequate configuration and extra refinement through plugins such as Creare SEO for Magento and WordPress SEO by Yoast. In the right hands, either platform can be optimised to a very high standard but due to its’ simplicity and speed, i’d be included to say WooCommerce is slightly more SEO-friendly for websites with simpler inventories. Since most e-merchants are in a constant search for better functionality - often at times, they tend to switch one shopping platform for another. What would you recommend to them in such case? Do you consider automated services to be a worthy option or do you prefer other methods? Migration between different eCommerce platforms is often a necessary process that happens all the time. Whether for more advanced functionality, by recommendation or following the trends, changing platforms can be a painstaking process that’s just as easy to get right as it is wrong. When supporting a client with a migration, I always prioritise their customer database, order history, Inventory and SEO architecture. Unfortunately I’ve seen too often cases where merchants fail to adequately plan their migration, resulting in unnecessary data re-entry, lost data and search rankings that have plummeted or disappeared altogether. Although different for every website, planning a migration is one of the most crucial initial stages of the project. I like to define with the client which data should be migrated through tools like Cart to Cart, manually migrated or reconfigured on the new platform to ensure that all new features are utilised and configured. Finally, have you got any forecasts about e-Commerce development in the future? Personally I believe that platforms like WooCommerce, Magento and Shopify will continue to break-down the barriers in providing merchants of any size with comprehensive functionality traditionally reserved for bigger brands and budgets. Software will further blur the line between retail and eCommerce for merchants running their businesses in tandem with a storefront. As more and more users become accustomed to buying online and through their mobile devices, I think we’ll see the eCommerce checkout and payment process significantly streamline in favour of one-click payments. Cart2Cart team would like to thank James for sharing his thoughts, and wish him and all our readers best of luck. Although, this is it for today’s interview, our series is far from ending. So, stay tuned, as much more fascinating expert’s insights are still to come.